The Historic Site Related to Catholic Priest Kim Dae-geon at Solmoe Maeul, Dangjin is believed to have been inhabited by the first Korean priest, Saint Andrew Kim Dae-geon (1821-1846), who made a great contribution to Korean Catholic history, as well as by a number of his martyred ancestors including his great-grandfather Kim Jin-hu, his father’s uncle Kim Jong-han, and his father Kim Je-jun. The birthplace of Kim Dae-geon was recorded in his entrance pledge to theological school (1836) as Solmoe, Myeoncheon, Chungcheong-do Province. The village of Solmoe, whose name literally means “a mountain dense with pine trees,” is now located in Songsan-ri, Ugang-myeon, Dangjin-si. 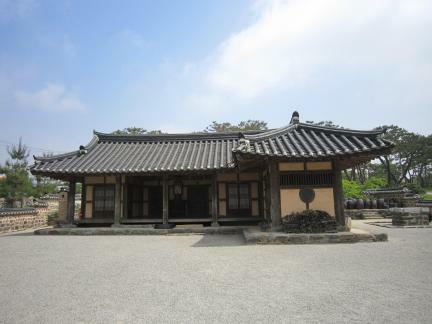 This historic site is considered an important asset in our understanding of the development of and changes in religion, politics and ideas, including the introduction of Catholicism and the persecution of freedom of thought and belief that occurred in Korea during its period of transition to a more modern society.